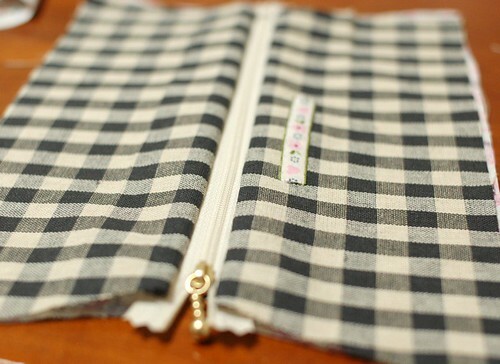 Today I write my way to make a zipper pen case. It is what I wrote previous post, but this is without sarubobo. 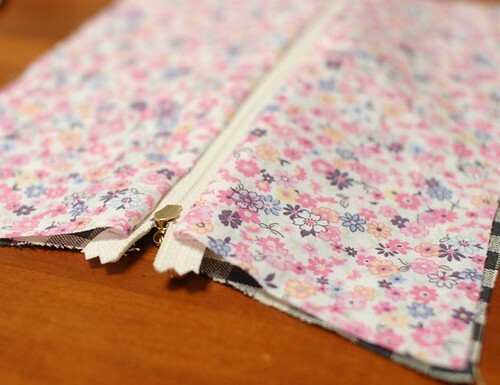 the outer fabric, the inner fabric and the zipper(of 20 cm). The pattern is like the picture. 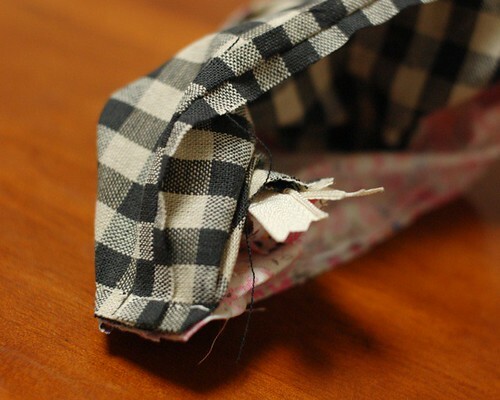 Put 7 mm allowance for the upper side(to attach the zipper), and 5 mm for the others. (The pattern doesn't include the allowances). 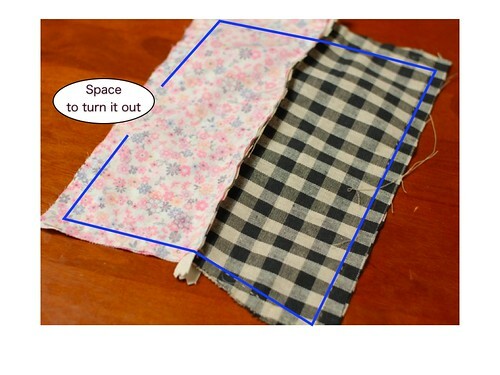 At first, cut the fabrics as the pattern, 2 pieces for the outside and 2 pieces for the inside. 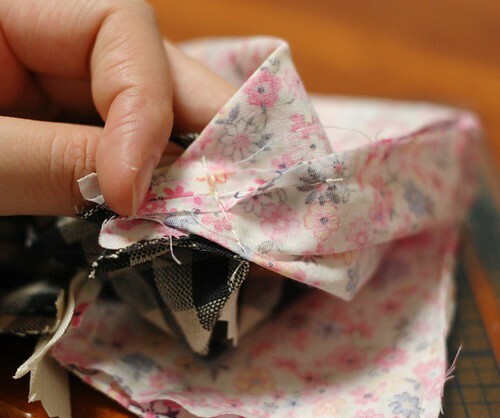 If you want to decorate the outside fabrics, do it now or after you put the zipper. I put a piece of tape on the front. Then sew the zipper. 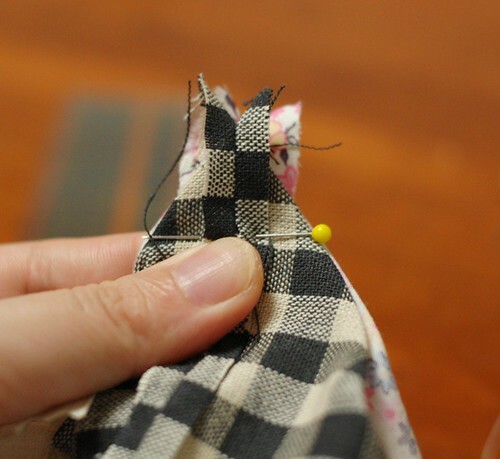 Put the inner fabric, the zipper and the outer fabric in piles, like the picture below (the right side inside). Take care of the zipper, in this case, put the right side upper. Put some pins and sew 7 mm inside from the edge. The picture shows after I sewed it. 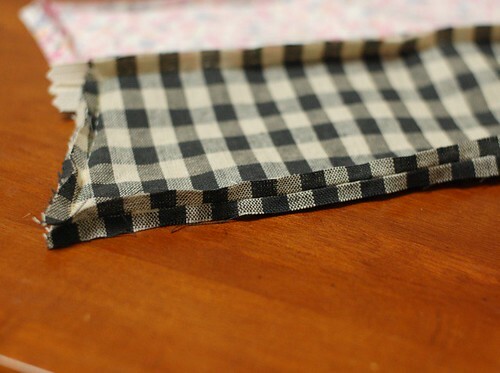 Then put the fabrics for the other side and sew as the same way. 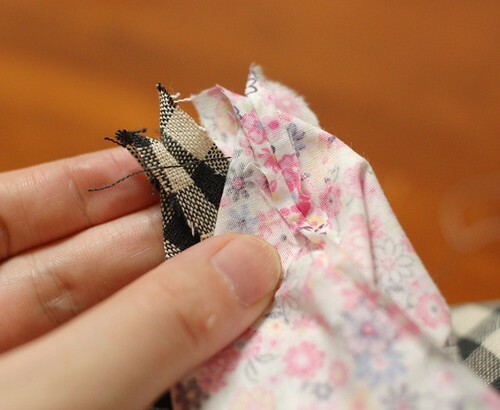 After you sew it, it comes like the picture below. Then open the zipper(it's important!) 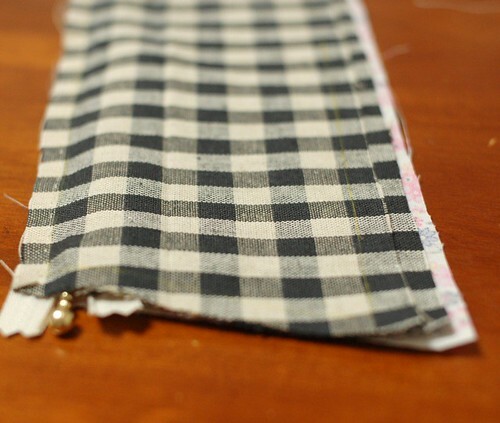 and turn the fabric like this picture, put the right side inside. Sew leaving the space to turn it out on the bottom of the inner fabrics. 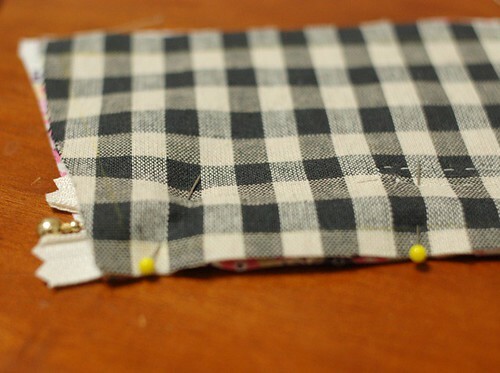 When you sew it, take care to fold the allowance of the zipper to the outside fabric(to the right side in the picture). It's to put the zipper in good way. Then open the allowance like the picture for the good looking. Make the gusset. Take the corner of the outside and the inside like the picture making triangle. 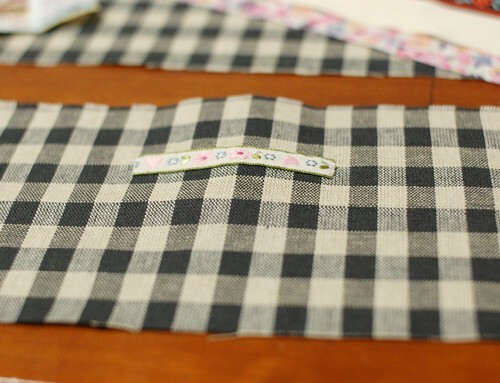 Pile them and put the pin 2 cm from the corner and sew there. Do the same on the other side and cut the corner leaving 5 mm allowance. Then turn it out from the space and close the space. I put a sarubobo as a charm (* v *). 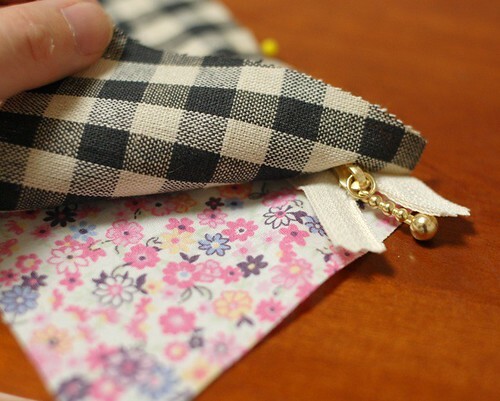 I think this is an easy way to make a zipper pouch. Please try it and if you find some difficulties, please write me! Thank you for this tutorial. You've made it look so easy! Your work is all beautiful. My favourite is the cat zipper pouches. So cute! Oh Mairuru! Thanks seems such an empty word since I have said it sooo many times but again thanks for this tutorial! I am dying to try it but will have to wait till I get back home!!! But it is in my list of must do things!! Your works are so nice, neat and unique! and your blog... well just wonderful like paradise for a clumsy girl like me, thanks to your tutorials I have been able to do soo many things!!! Great Mairuru!! Thank you so much for this tutorial!! You're so generous!!! I love it!! I keep saying this, but thank you so much! Not only is your handwork beautiful, but the way you explain things makes it easy to understand. This weekend I will try making a pencil case (and a sarubobo or two) I have tried in the past to make a pencil case, but never figured out how to have the inside look tidy. Your instruction is so clear. Thank you again. I wonder why I never thought of sewing in the zipper first! So much easier than trying to get it in neatly after the bag is all made. Thank you Mai for sharing your methods for making all of your things. You have inspired me to pick up my sewing again after many years. I hope it is ok with you that I just linked to your blog from my last post. I finished my first sarubobo and told that I found a tutorial for them in here. Thank you for teaching it! This is fantastic! I need one of these to hold all the fine tip Sharpies I carry in my purse. Thanks SO much! I'll be linking. This is a great tutorial. Thanks for taking the time to put it together and for sharing your creations. Mairuru, this is so cute. Thank you for the tutorial. 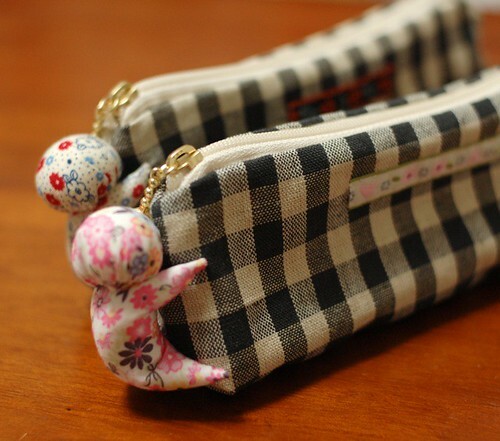 I am going to make one of these pencil cases for my god-daughter this weekend. Your directions are clear and the photos are great. Great tutorial! The pictures really help make everything clear. This is a super idea. I'm happy to share it. If you have any trouble with this tutorial, please tell me! Mai this is soo cool! Thank you for another great tutorial..i love this one lots! Hope your having a wonderful weekend and love to you! I've seen all your old post and I love when you speak about your contry...as a great reader of Banana Yoshimoto and Haruki Murakami, I love Japan. Have a nice day :) Cheers from Italy! great tutorial, something lovely to create in the evening in front of the telly. Beautiful blog, it's like a frolick in an enchanted forest. Hi Mairuru! I wanted to thank you for this tutorial. I was looking for a really easy way to put the lining into my pouches, purses and pencil cases, and I think this way you have shown us in this tutorial is just perfect!! I used it for the first time this weekend to make these pouches and I'm so happy about the results!! I'm just making this kind of pen case. It looks just perfect and stylish. And making sarubobo for it at the moment. I want to say my gratefulness to you. Thanks so much for this! It's awesome. 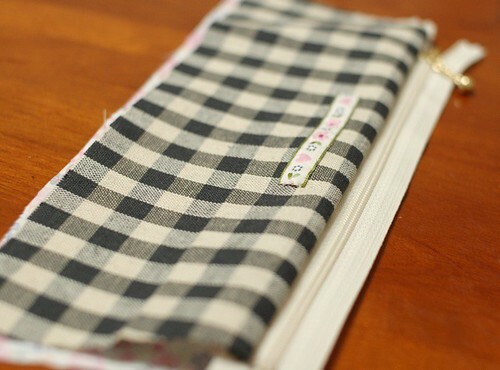 I used it to make a pencil case, and will make more soon. Hi Mai! 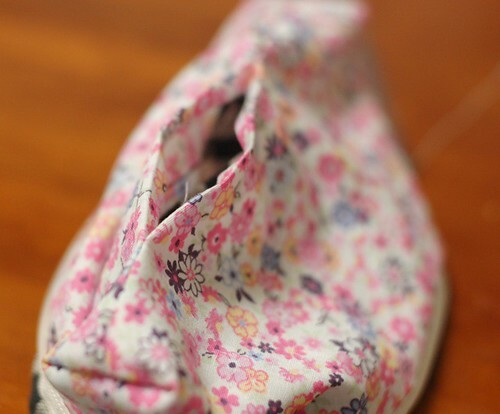 Thanks for the tutorial :) I've made a few pouches for my teachers :D you can see them here! 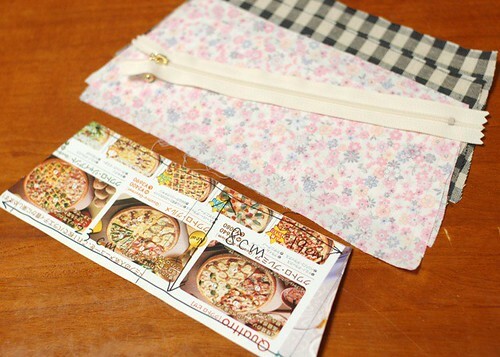 im desperate to make this pencil case for a christmas gift for my mum, dad, grandma and grandpa. i just cant figure out how to do the end bit, the gusset. which way do you bring the outer and inner fabrics together? ps im japanese too, but i live in australia. I'm sorry for the bad explanation. Please put the sides(of the outer fabric and inner fabric) inside, and the bottoms outside. So you could see the bottom lines. Could I explain well ...??? No, your explanation isn't bad at all, many others have understood your instructions! But I'm 12 and only a beginner, my sewing is abysmal and i am not being modest. And for that reason i am still confused. What do you mean by the 'bottom' of the fabric? So, to bring the corners together, which way am i supposed to fold it? Sorry, my ignorance must be rather frustrating - but i hope you understand the situation. Hello again. Looking carefully at your finished pen case, do i simply just box the corners? I wanted to tell the bottom of the pen case. Could you see this site? She used more pictures than mine. I'm sorry for making you confused. You could make it without sew there. After you turn it out, you could make gusset. oh, thank you, thank you! i got it now, though they were a bit wonky. Well, what did i expect~lol. 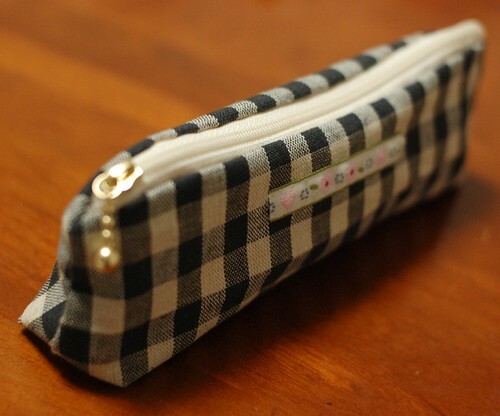 By the way, i love the black gingham! Could you do this with leather?? Thank you so much for the tutorial! I modified the measurements a bit and made a coin wallet type of thing for my boyfriend! Thanks! Your blog is really excellent. If you go on with your research related to this topic, I would probably order dissertation reference at the thesis service in web. 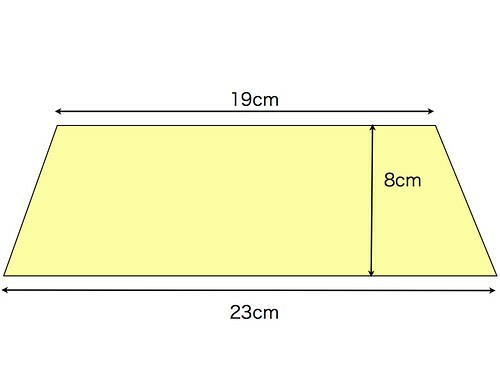 I think that this is a nice information to read a question that has some importance that How to make a pen case. I think that this is a good thing to ask for. This is the well design wallets that has the great demand in to it this is the nice blogs too. That spreads a lot of information. This is some thing interesting to ask for that how to make a pen case because this is some thing that has a lots of usage and work and this is needs to get used. This is very nice. Thanks for taking the time to show how to do this. This is beautiful neat. This is the topic which is related to How to make a pen case this is a relevant sources that are to be understood easily. This is just a work of art. We have never seen any think like this. This is just beautiful. Somehow i ended up with one side larger than the other even though i did stich the pieces by the middle. Anyhow, it looks almost right, so I'm keeping it like that. Thanks for the tutorial. Cool pen case I really looking forward to see your next post. This is absolute brilliant, even the measurements are given, such a talented person and fantastic post. Thank you for the text. Though the strategy is regularly criticized by experts in the field, it is being used under the guise of implicit analogies tacitly approved by those at the top. Hey, your tutorial is quite helpful, but a little bit hard to follow at times. Thanks to you I made a beautiful yellow pen case that I named "Tropicana"
Was this hand sewn or did you use a sewing machine? I made it.... It's really easy and thank you so much...! This is fantastic, I just have one question. How did you affix the sarubobo to the pencil case? Thanks for the pattern, just one question. How did you attach the sarubobo to the zipper? This looks great, but I'm rather new at sewing so I have a newbie question :)...So since the allowances aren't in the pattern do I have to cut out a bit larger pieces of fabric than in the pattern? This is the best tutorial for a pencil case. You explain things so clearly. I love this little project. It is the best possible of the every client procuring the paid variant Service to appreciate the consistently inside the kinship of the adult performer. On the other hand it's miles just critical to esteem their calling and highlight the due respect for the woman finding you as independent of something are her vocation she before everything is an individual that is the prime issue that subjects parts. You may make your inclination from the especially arranged young ladies on the possibility of the severe components. The more for the most part accessible classification made for the clients to settle on the decision of the most loved night companion comprises of the rendition escorts, Lebanon escorts, living arrangement life partner escorts, television sequential performing artist escorts, air lady escorts, VIP escorts, style fashioners escorts and Lebanon escorts girls. They look classy and trendy!